I finally had a chance to do something in the garden. My spring itch has subsided a little bit once I had the chance to get my hands dirty. The garden is still covered with a foot or so of snow that is slowly melting away. 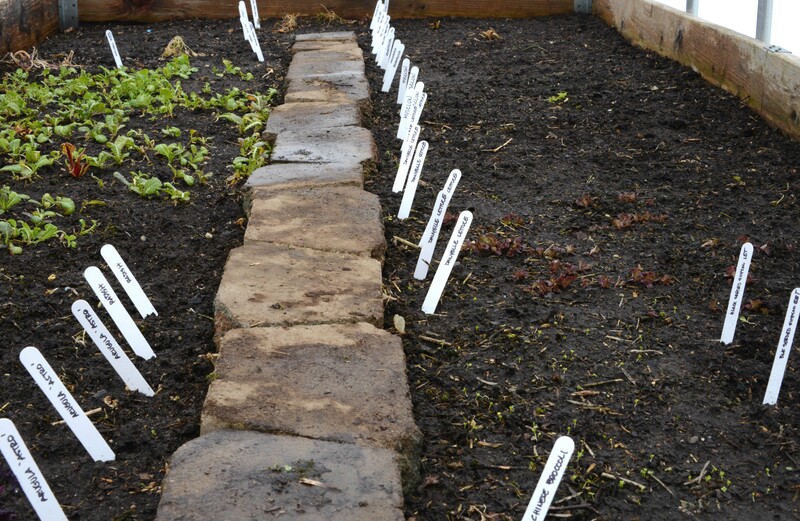 We made a path to the bird feeder a few weeks ago and today I made an extension path to the vegetable garden. I opened up the cold frame for the first time today. It has been closed up for the last three months. I had good intensions to grow and harvest vegetables in winter but I couldn’t get access to it. With three feet of snow covering the vegetable garden and temperatures that dropped to below 0 degrees Fahrenheit and sometimes double digits below, I didn’t expect to see anything alive in there. I also haven’t been able to water inside since I closed it up. 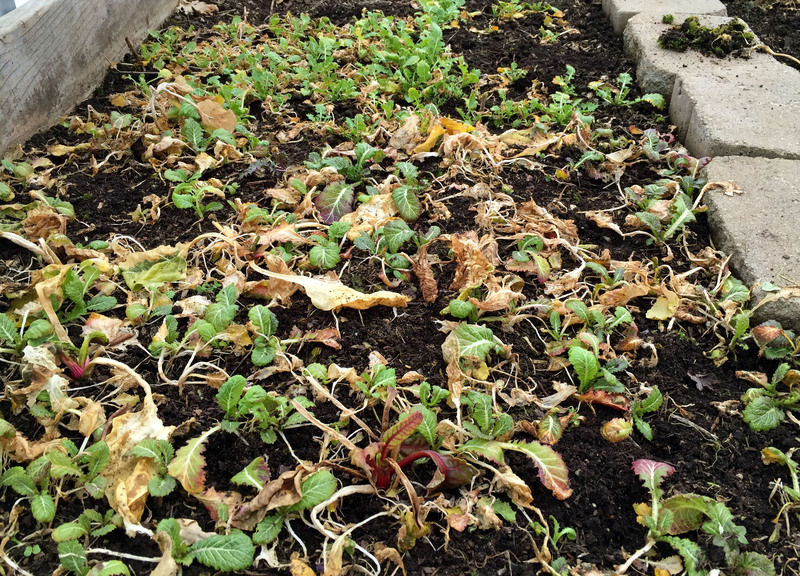 This is what our cold frame looked like in winter. Snow covered up to half of the frame. The temperature was hovering around 40 degree and I managed to dig my way there so it’s a good day to check the inside. As soon as I pulled the tape off and opened the plastic ‘door’, I could feel the heat rushing out. To my surprise, there were some red lettuces, mustard greens ‘Dragon tongue’, Mizuna, Red Russian Kale, Swiss chard and some carrots that survived the ordeal. Not in such a good shape though. These are the ones that made it through winter as seedlings and now they are not much bigger. 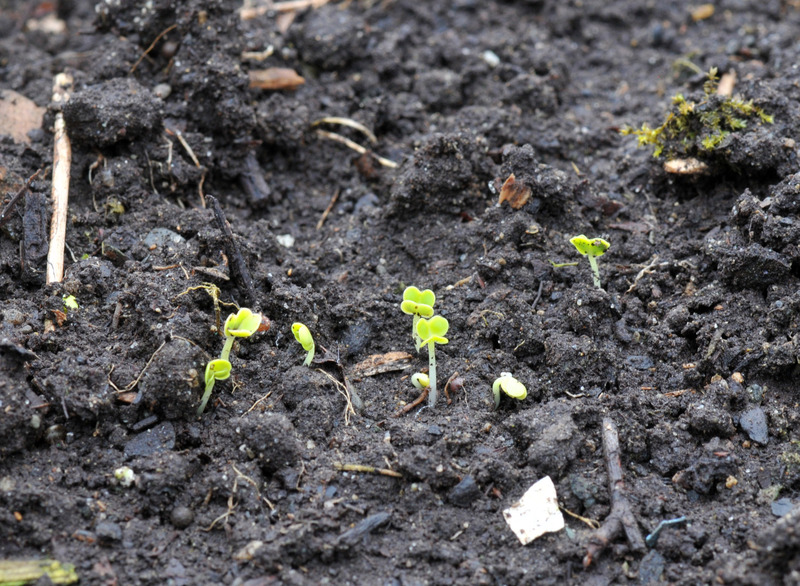 There are also some new seedlings that sprouted up. I have no idea what they are. My best guess is either Broccoli Raab or Pak Choi. The survivors: Mustard green ‘Dragon tongue’, Mizuna, Swiss chard ‘Ruby red’. A lot of their leaves have dried up. Even without watering for the last three months, the soil in side is still moist. 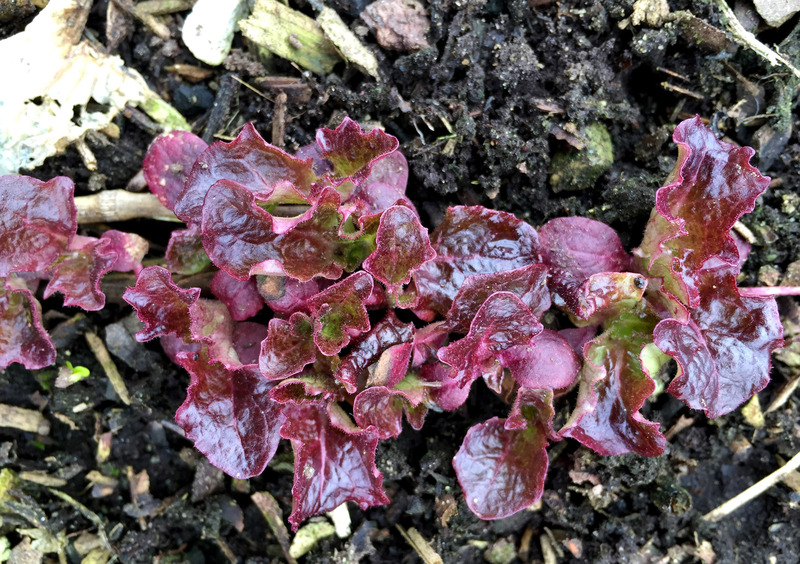 As much as their leaves look very fragile, this red leaf lettuce pulled through. I pulled one of this Mustard green ‘Dragon tongue’ and tasted it. It was surprisingly sweeter than in summer. I took my time cleaning up inside the cold frame; pulling up the dead, clipping off dry and rotten leaves, and pulling up weeds and moss. Then I put new seeds in. The day time temperatures are still around 30 and 40 degrees fahrenheit and at night will drop down ten points or more most of the time. However, the temperature inside the cold frame is much warmer because of the heat trapped inside. So, this is a good time to put seeds in to get a head start for salad and transplanting later on. I’m happy and satisfied getting my hands dirty. In two to three weeks, we will have baby greens for salad. 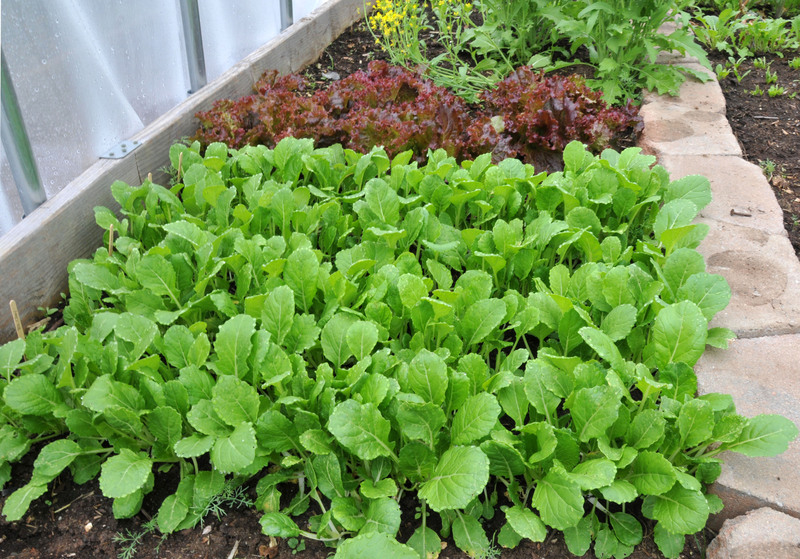 The vegetables that survive the winter will also be big enough to harvest for soup and stir-fry. After cleaning up, sowing new seeds and watering. Ready to close up again. See you in a couple of weeks or when the weather allows. 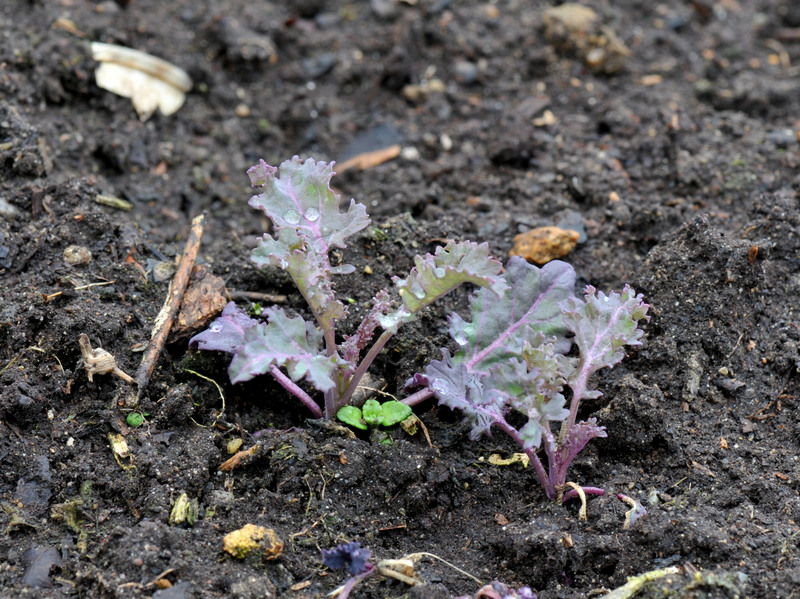 By the time we finish with the greens, the temperature outside should be warm enough to transplant Swiss chard and kale to their permanent spots. The following are the seeds I put in, most of them do well in cooler temperatures. There is not much left in the vegetable garden especially after temperatures dropped below 20º F. I didn’t have time to cover the plants outside the cold frame: Mizuna, Broccoli Raab, Scallion, and Mustard Green. But they perked up a little bit once the temperature climbed above 50º F. Heavy snow is predicted for today so I harvested some Mizuna and Swiss Chard and steamed them with fresh tuna yesterday before they got buried under the snow. This winter will be the second year we put up a cold frame. 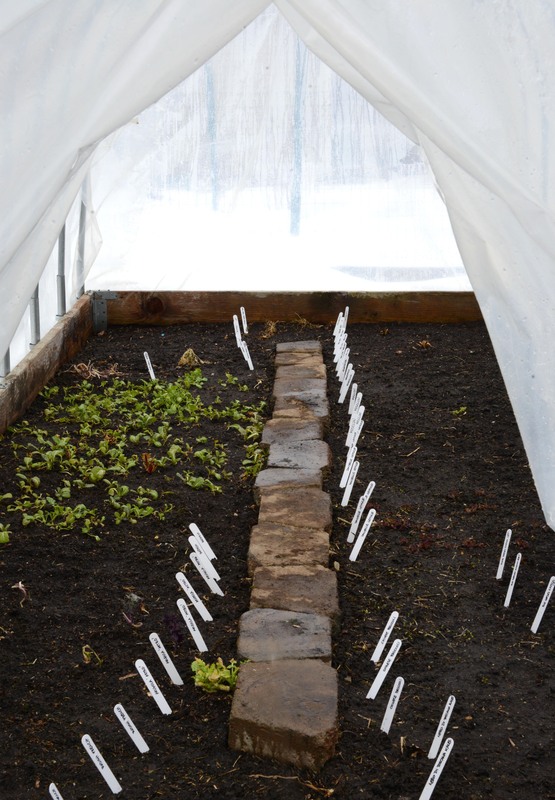 Last year was our experiment in growing vegetables in winter under a cold frame without extra help from a heater. We started the whole process very late last year and the winter was extreme, but we still had salad when it was freezing outside. The frame nearly collapsed from heavy snow piled on it but it was very encouraging to be able to have fresh greens from our own garden in March. We have assembled everything early this year. We also added supporting bars to the hoops so we won’t have to hold our breath during a heavy snow fall. Our cold frame last winter had become a little igloo. 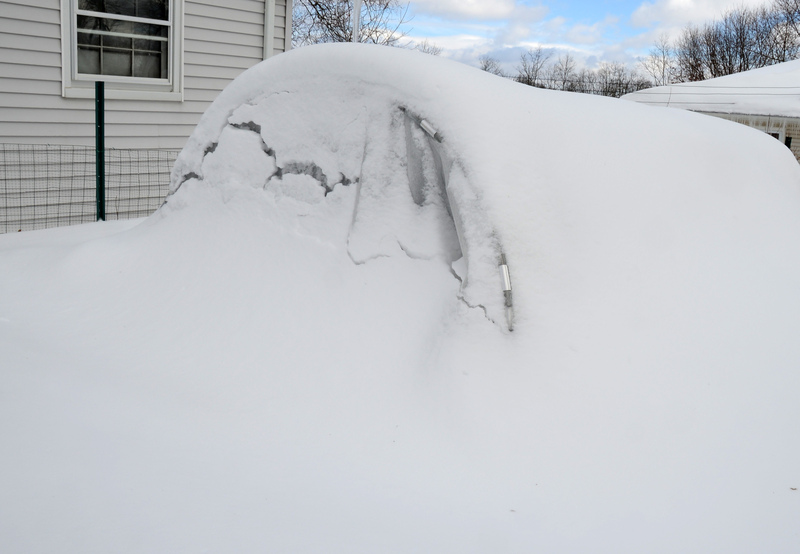 The frame slightly collapsed inward from heavy snow. This year’s cold frame with three additional supporting bars. 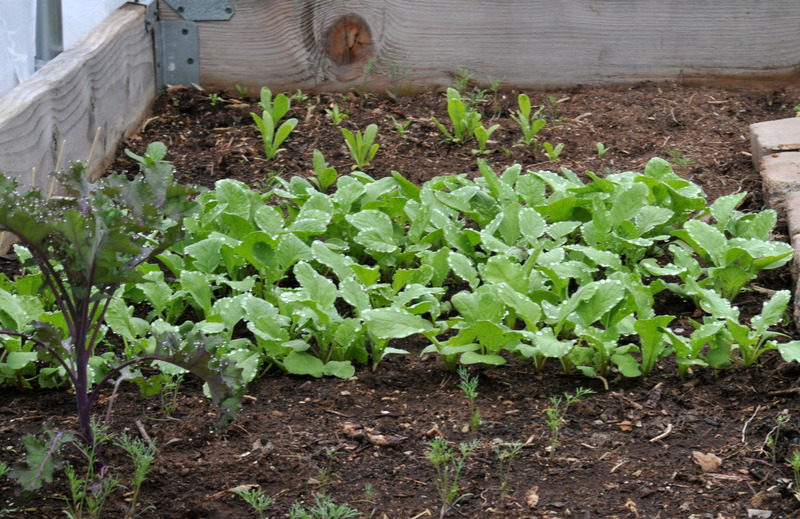 I’ve sown Chinese Broccoli, Kale, Swiss chard, Chinese celery and Arugula in this plot in early September. They’re growing quite nicely. 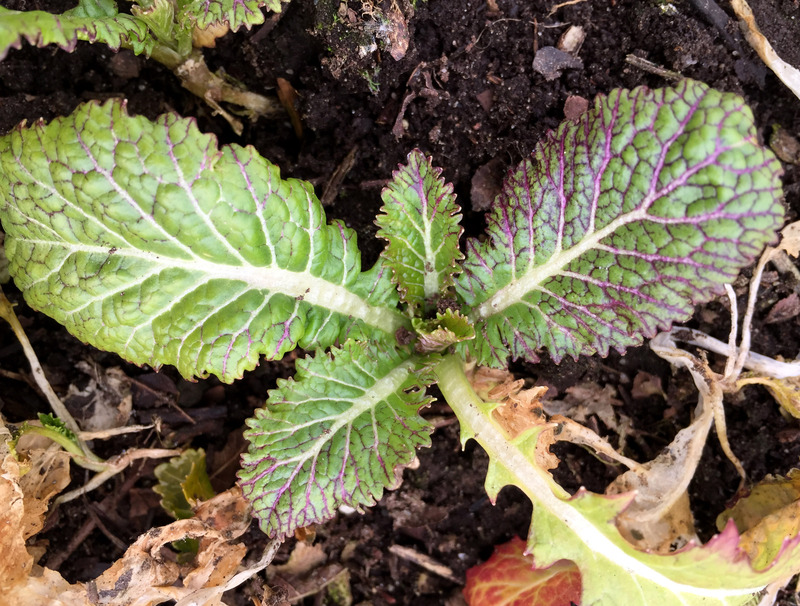 Mustard Green ‘Dragon Tongue’ sprouting up from fresh compost I added to the plot is a pleasant surprise. 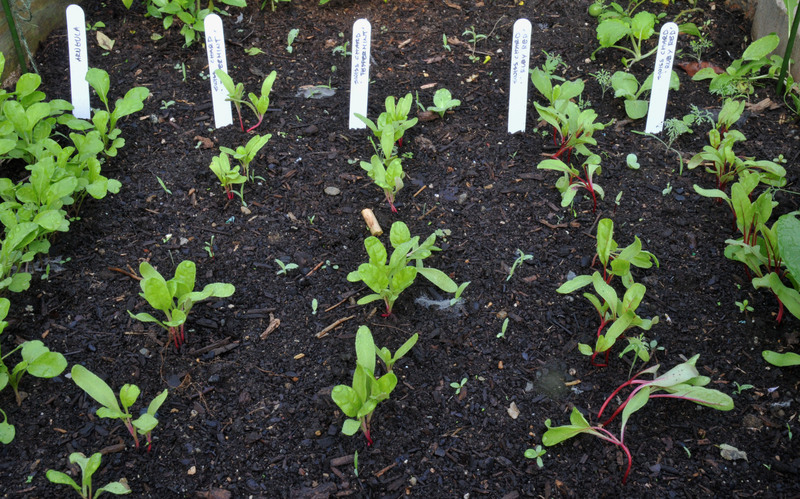 Pac Choi seeds sown weeks ago also sprouted but turned out to be Mizuna instead. This mislabeled seed package has become my problem lately since I frequently forget to label the seed pod packs when drying them. Unfortunately they all tend to look alike. Too late to sow another Pac Choi in there for this winter; they wouldn’t sprout until next spring. 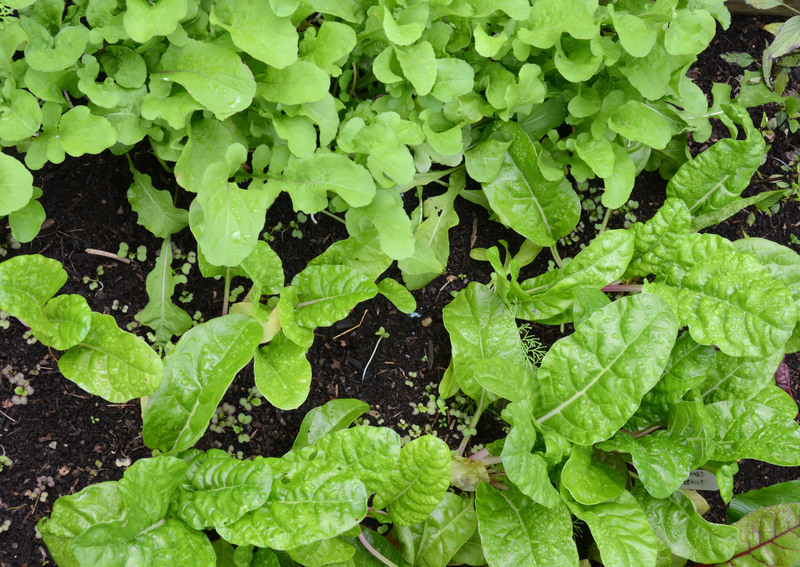 Arugula and Swiss chard seedlings in early September. 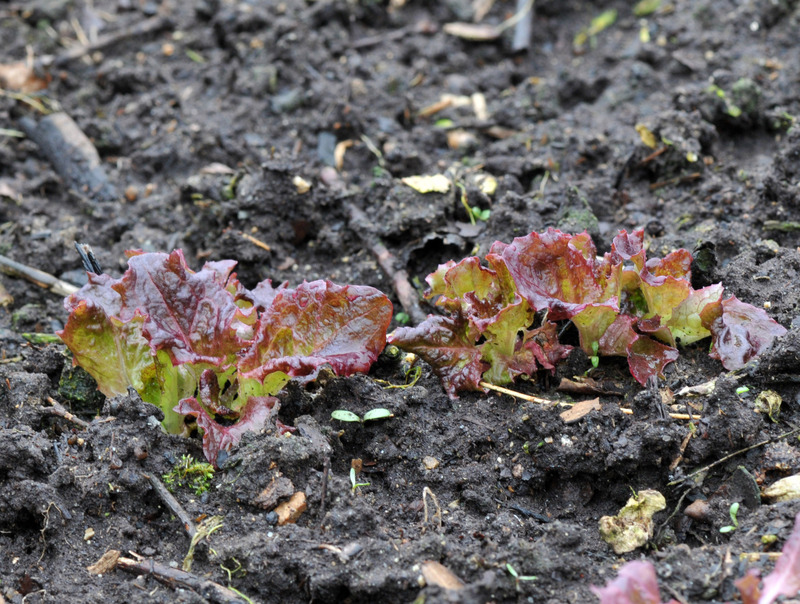 Slugs have eaten all lettuce seedlings. My second batch will have to be in the house as baby greens instead of full grown lettuce. I put a beer filled container in there but only two slugs took the bait. I think they only go for fresh beer, not the one that their comrades have already drowned in. I picked off a few more fat slugs yesterday and don’t know when my next chance to check inside the frame will be, hopefully it will be cold enough to slow their metabolism down. Chinese broccoli looks perky and happy in there. 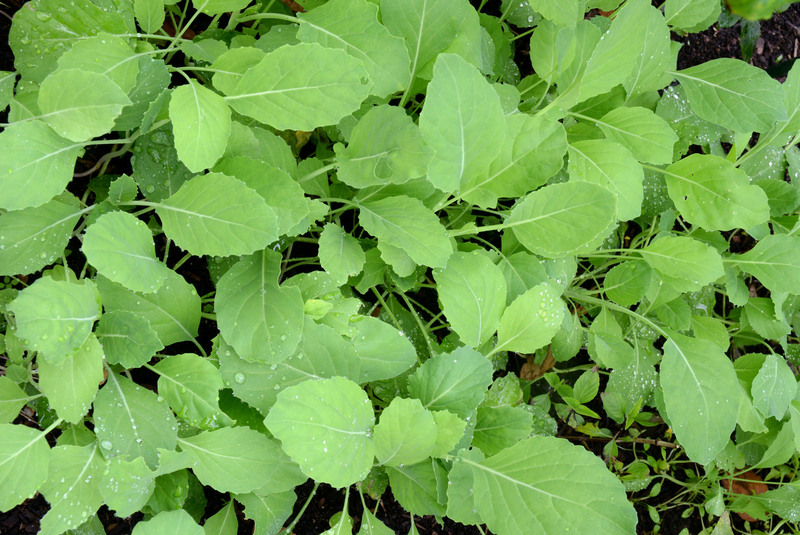 Now the slugs have moved on to devouring the Mustard green ‘Dragon tongue’ seedlings (above image). Surprisingly enough they won’t touch the Edible Chrysanthemum sowed since spring. It’s a vegetable worth growing because I can sow it once in spring and keep harvesting it until late fall. I cut them again yesterday but left enough stems to see how they will weather this winter in the cold frame. Snow is coming down today and expected to be around a foot by its end. Hopefully I can make a path to the cold frame and pick some salad tomorrow. We set up a cold frame for the first time last autumn but it didn’t do much for us this winter because we installed it so late in the season. However, it provided us with a place to start our vegetables early. 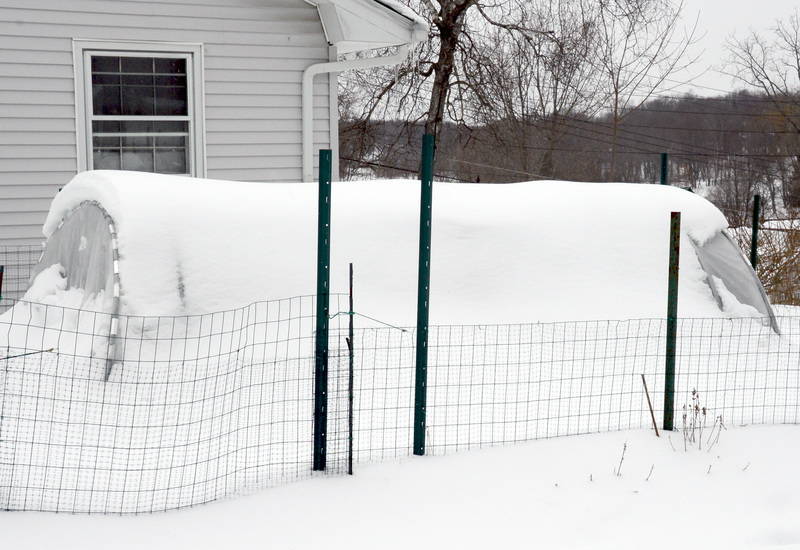 The seeds were sown in March when some days were still hovering around 20ºF here. 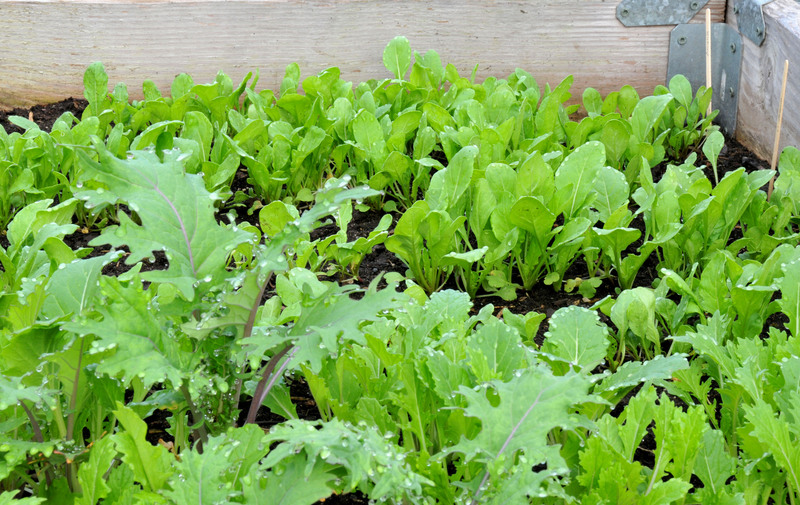 We were able to pick our first salad of the season in April when temperatures outside were in the mid 30ºF to low 50ºF. The weather is still unpredictable. Temperatures have been swinging between 70ºF daytime and a low around 40ºF at night. It’s still too cold for many vegetables to germinate outside, but I have sown scallion, Mustard ‘Dragon Tongue’ and Oakleaf lettuce in the plot outside the cold frame and it seems to be taking them a little bit longer to sprout. But I can wait as I still have a lot of vegetables to pick from in the cold frame. Aside from being able to grow leafy vegetables in the cold frame on an early schedule, I’m also able to use it for strengthening the seedlings. Plenty of sunlight can get through the plastic but not direct sun and it stays warm enough in there to avoid stunting the growth of the seedlings. I have to be careful to open it up during the day when the temperature reaches above 50ºF. It becomes a sauna in there if I don’t open it. Too hot or too cold is never good for growing anything. This one worked so well that I’m tempted to get a larger one that will cover the entire vegetable plot. Maybe I could go through winter without ever buying salad from a store. Last year was the first time I grew vegetable in a cold frame. 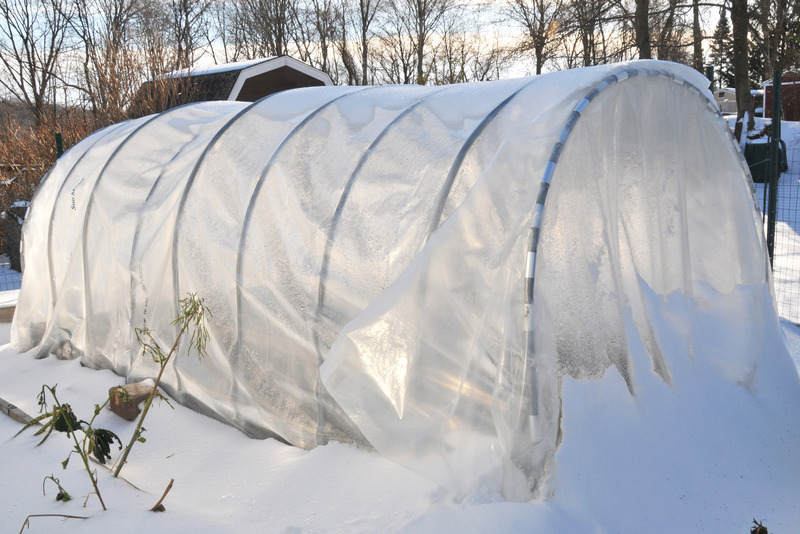 It was an experiment in extending the growing season without using a heater. I started late in autumn so the seedlings didn’t have much of a chance to build up strength. The winter was also brutally cold with temperatures dropping below 0ºF for several days at a time. 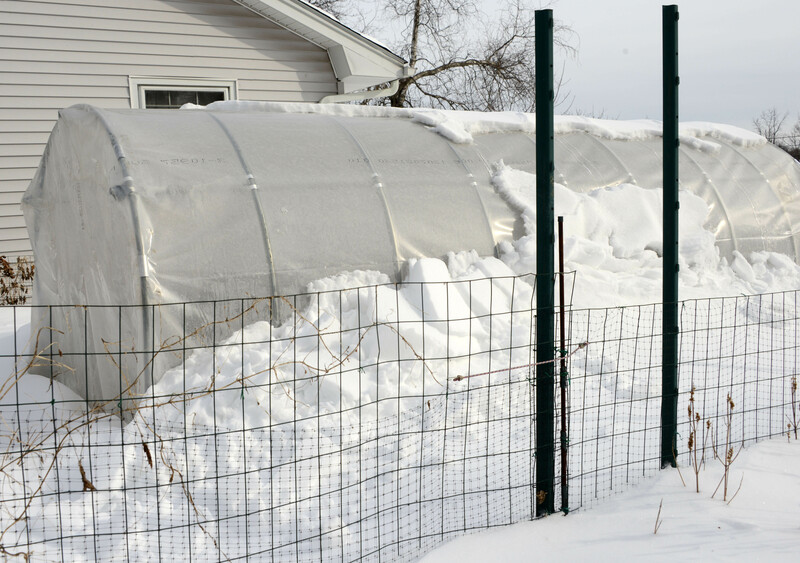 Two feet of snow completely blocked the path to the cold frame and turned it into an isolated igloo-like structure. I didn’t expect anything to survive in there. The weekend before last when it rose above 40ºF, I decided to open the plastic cover for the first time. 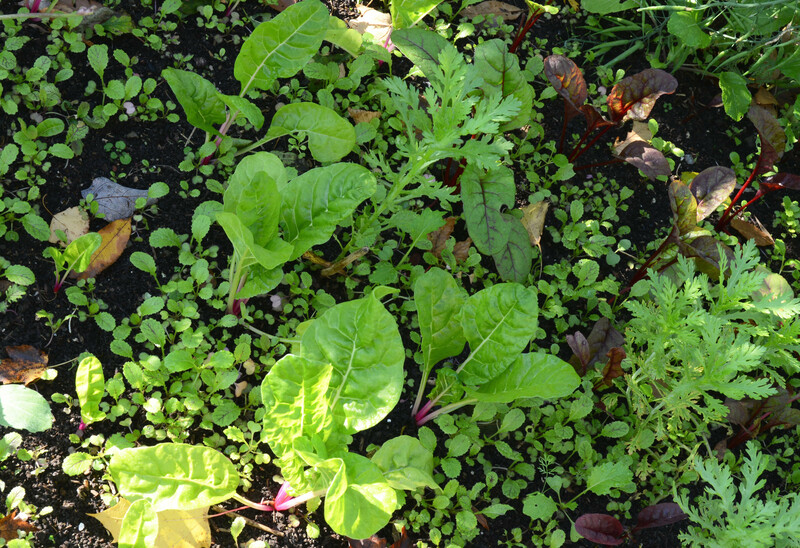 To my surprise, some red leaf lettuce, kale and broccoli raab I had sown last fall survived. The parsley I transplanted there also survived. The cold frame actually works. If I had started it early in the fall and had access to it I would have had a better outcome. I still have more to learn as well as adjustments to this system. Almost three months of no watering and most of the soil was still damp though parts of the top layer had dried up in places. 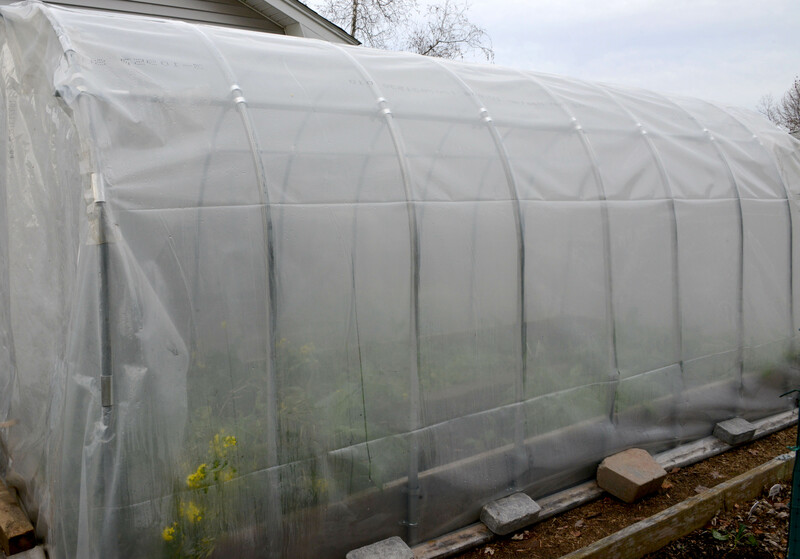 The plastic cover is not just to keep the cold air out but also to keep the heat and moisture in. After opening it, I kept the plastic cover open on both ends to allow fresh air to flow through and for me to be able to water the soil inside. Then I sowed Pac choi, Arugula, Chinese celery and Mizuna inside. 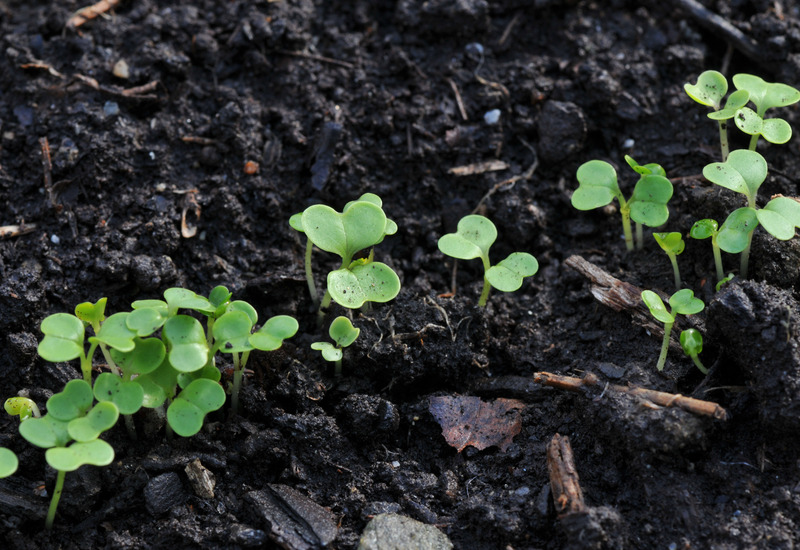 The Pac choi sprouted first, six days later. I opened the cover again this weekend and kept it open for most of the day as it wasn’t very windy and the temperature stayed above 40ºF. I also put in spinach, French radish and Cherry belle radish seeds. If everything works right in the cold frame, I won’t have to wait much longer for my first backyard salad. I still don’t know how this experiment will end up. The whole thing started when I wanted to extend the growing season here in the north, growing winter vegetables without a heated greenhouse. After reading books about growing vegetables in winter, especially when one of them took place in Maine ( Winter Harvest Handbook by Eliot Coleman), I decided I would give it a try. Maine is colder than where I live and if he can grow his vegetables inside a cold frame without a heater, then why not I. That was my encouragement. It hasn’t done much so far but that is my own fault. I started too late in the season. This cold frame requires two people to set up and we hardly have days off together so the project was put off until late October. Did I mention the wind? Don’t try to set this thing up when it is windy, especially a cold wind. Seeds I sowed in there like Pac Choi, Scallion, Swiss Chard, Red Kale and Arugula sprouted up a few inches and then seemed to stop at this stage. 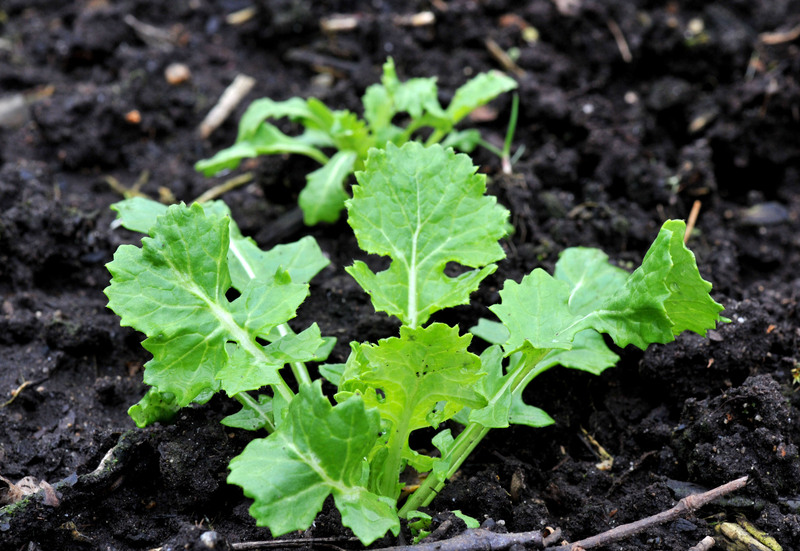 Those that have grown or were transplanted in there like Toscano Kale, Chinese celery, Swiss Chard and Parsley seem to be alive and haven’t frozen. 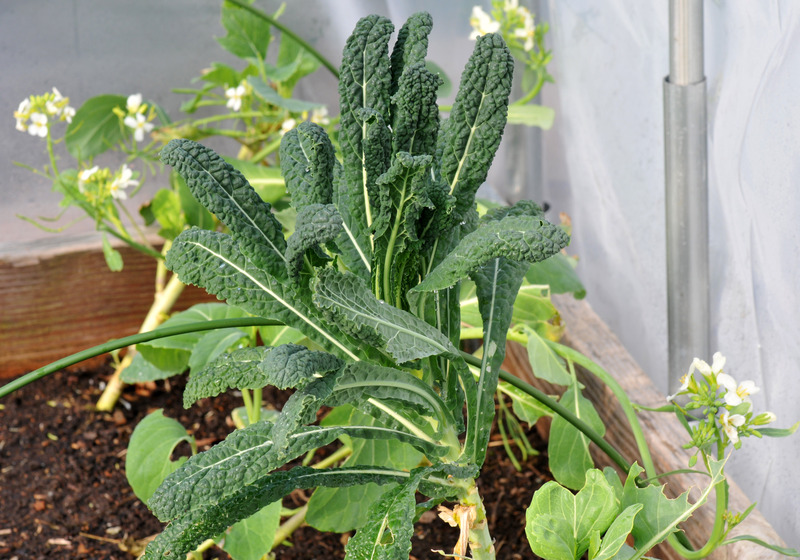 The Kale and Chinese Broccoli I grow in that area earlier are doing fine with 20ºF outside. It remains to be seen what happens with even lower temperature coming this weekend. The weather forecast is predicting that the low temperature this Friday night will be -4º F. If they survive, it will give me more incentive to start earlier next fall. I miss fresh Pac Choi and Mizuna! If it doesn’t work this winter, I still be able to use the cold frame to start seedlings earlier next spring.